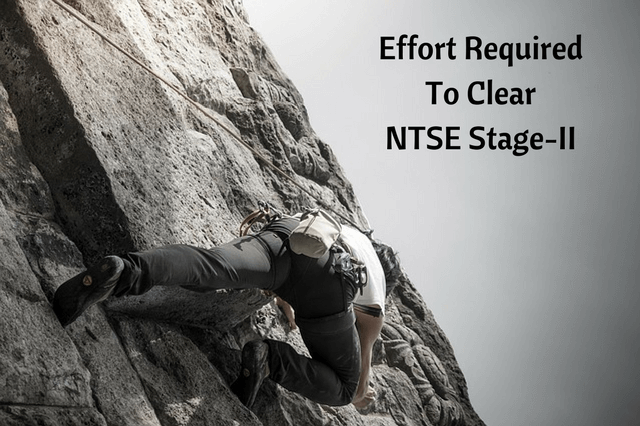 How Much Effort Required To Clear NTSE Stage 2? How Much Effort Required To Clear NTSE Stage 2? I would say prepare and put your efforts for NTSE Stage-2 in such way that you clear it with ease. You’ve now qualified Stage-1 and I know that you won’t like to call yourself NTSE Stage-1 qualifier even after immense hardwork, rather you would like yourself to be called an NTSE Scholar. Prepare and keep the above words in your mind till you qualify and become an NTSE Scholar. Before you go to sleep, plan out the next day schedule – What topics have to be completed, how they are to be completed, if you did not complete any topic today then how it should be managed with tomorrow’s studies, etc. Revise daily at the end of the day. Daily revision would ensure that you don’t forget facts in the subject like Social Studies and Biology. Focus on those topics where you can score high with ease. Like MAT, Social Studies (mostly NCERT based), Biology. Just get qualifying marks in Language Test because a high score here won’t add up to your total score. Update, 8th December 2017 : From NTSE 2017-18, there will be No Language Test in NTSE Stage-II examination. Do take mock tests on regular basis. Where and why you went wrong? What was your accuracy ? Did you get stuck on a question, if it was so, then why? Did you make any bubbling error? Were you feeling tensed during those test hours? If yes, then you must improve upon that. How was your concentration? Were you distracted by small changes or disturbances in your surroundings? Try working out on these points in addition to your studies. Preparation and strategy both must be good for good results. Ashesh is an undergraduate student at Indian Institute of Technology, Kharagpur. He is passionate about photography, a lover of art, loves accepting challenges and learning new things.